100 Watt CFL Grow / Update#4: What Should My Marijuana Plants Look Like After 3 Weeks? Today I would like to give you a before/after view of the 100Watt CFL grow cabinet. It’s useful to have a watermark with which to compare your grow progress. 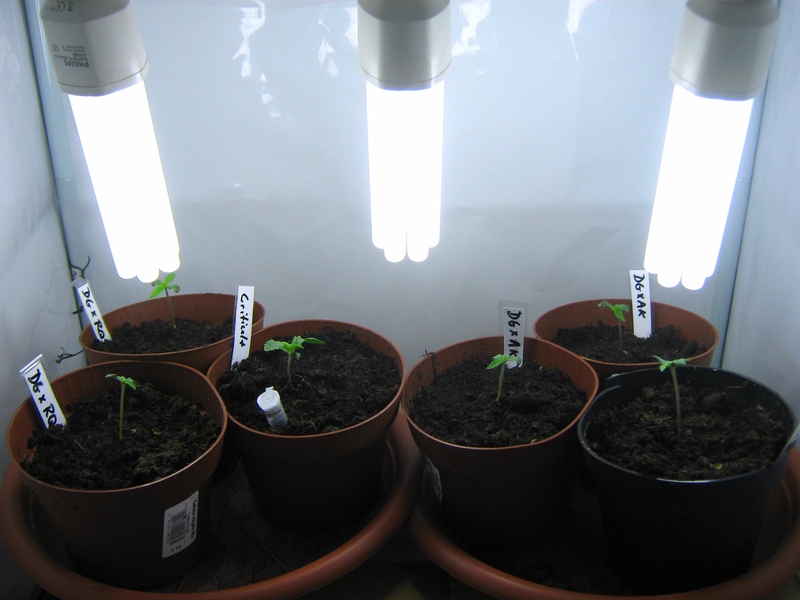 Here’s a short post to show you the plant progress under 100 Watts of 6500k CFL lighting. The third photo is of the Dinafem Critical+ plant, which (as noted in previous posts) is a few days older than our cross-bred plants, which sprouted two weeks ago today. We have culled one plant, and now have five in the grow cabinet. Of these five, we hope at least three will be female so we can show you each plant type all the way to harvest under 100 Watts of lighting – a very budget-friendly marijuana growing technique. First, here is the Royal Queens Seeds “Royal Automatic” x Sensi/White Label Double Gum cross. There are two of these plants, and they are the most vigorous of the lot. If they turn out to be Autoflowering, they will be very impressive indeed! 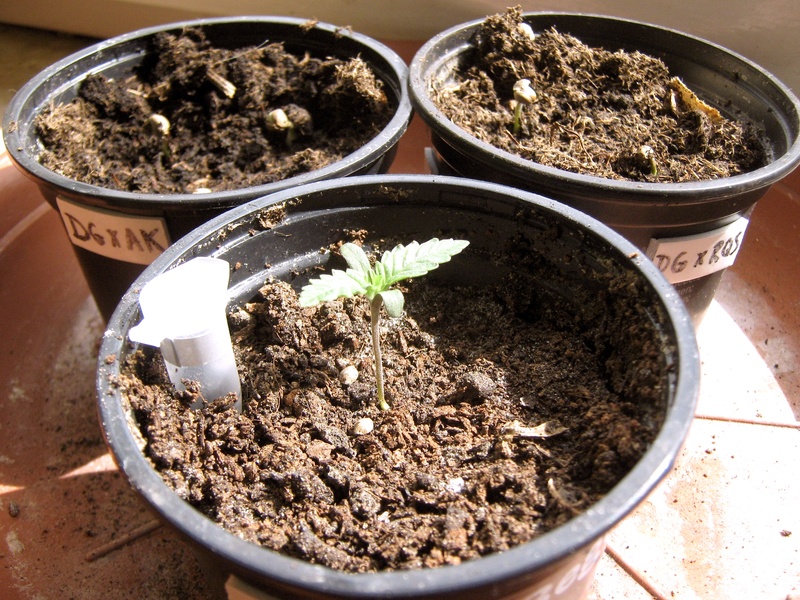 100 Watt CFL Grow / Update#2: What Should A Marijuana Plant Look Like At 2 Weeks Old? Plants will vary in size and appearance depending on a variety of factors: Genetics, soil, lighting, nutrients, temperature, handling, and the elusive “green thumb” factor. As you can imagine, a plant growing outdoors under full sun in June (northern hemisphere) will be a lot bigger at 2 weeks old than a plant growing in a converted computer case running 50 watts of lighting! 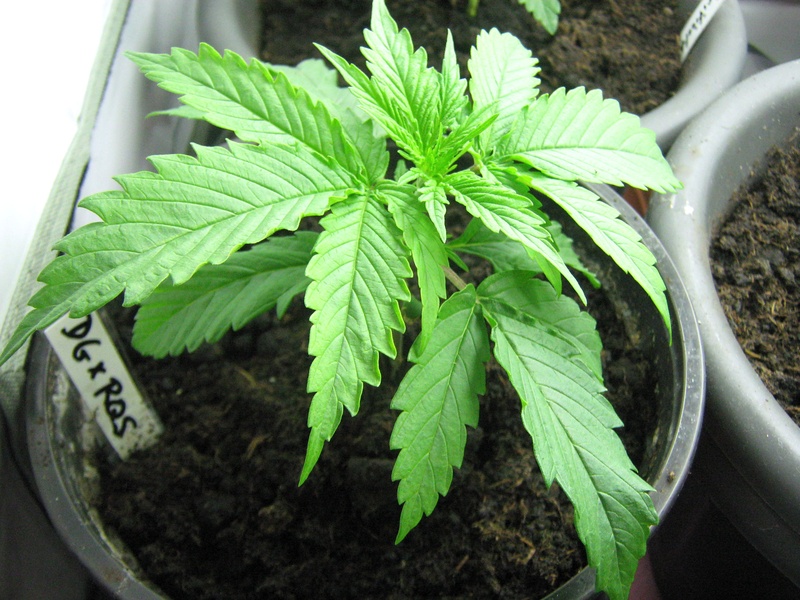 In any case, cannabis plants do tend to develop certain physical characteristics at certain times in their life span (first true leaves after 3 – 4 days, alternating nodes after 30+ days of vegetative growth, calyxes and pistils after a week of flowering light schedule, for example). 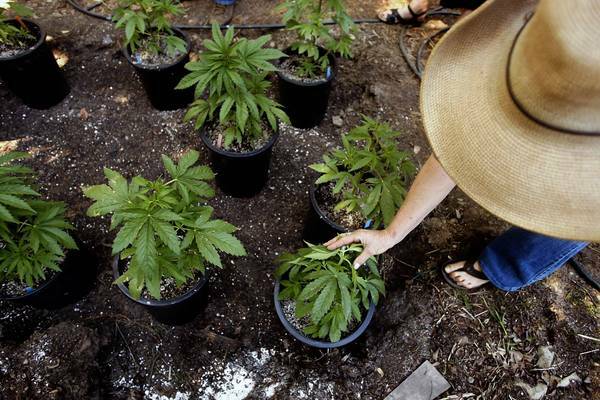 Barring any problems, after two weeks of vegetative growth, you can expect to see a plant with several sets of leaves, and are likely to be able to smell that characteristic “mary jane” smell on your fingers after gently rubbing the leaves. Don’t be surprised if your plants leaves alternate between “reaching up” towards the light and “sloping downwards” towards the ground – this is normal. Leaf color will range from an intense, deep green to a light yellow-green or “lime” color. What isn’t normal is yellow leaves with stunted-looking new growth, patches of brown or browned edges, dark spots or a mottled look to the leaves, or leaves curling up into a sort of “taco” shape. Here are some shots from our current 100 Watt CFL grow. A two-week old Dinafem Critical + plant. She’s (yes, “she” – this is the only feminized seed in this grow) looking quite healthy and of good size for the humble 100Watt grow. She’s ready for transplantation into the larger final grow pot. Just two days after the previous post, the then-sprouting hybrid seeds are enjoying a “sun”bath in 6500k CFL lighting and are now showing their first true leaves. Three 25watt 6500k CFL bulbs are shown in the picture, and one more was moved out of the way for the picture – in total they will be under 100 watts for this grow. This is a good chance to give you a few more seedling care tips that have occurred to me since the previous post on the topic. I like to start seedlings in soil, rather than in rockwool, special sponge pads, etc. I have had better luck in the past transplanting them into soil when they were started in soil. 100 Watt CFL Grow / Dinafem Critical+ And Our Own Hybrids! It’s time to show you some step-by-step results from one of the techniques I recommend to home growers in our “How To Grow Cannabis At Home: A Guide To Indoor Medical Marijuana Growing” eBook – a 100 Watt grow using CFL bulbs on just two plants to keep the grow size manageable yet produce enough cannabis for personal use. Cadets In Training For A 100W CFL Grow.